Here is a beautiful little gem of a release from the remarkable Australian Melba label. 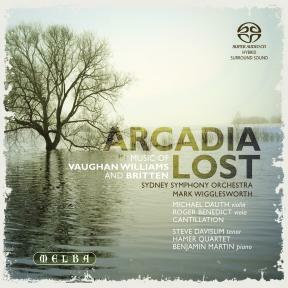 Devoted to two of the biggest names in English music, Arcadia Lost features three scores by Vaughan Williams (The Lark Ascending, Flos Campi and On Wenlock Edge) and the Sinfonia da Requiem by Benjamin Britten. The Lark Ascending for solo violin and orchestra dates from 1914 and was then revised in 1920 to be created the following year in 1921. Flos Campi for solo viola, wordless chorus and small orchestra was created in London in 1925, inspired by the Song of Songs. On Wenlock Edge, for tenor, piano and string quartet dates from 1906-9. As for the Sinfonia da Requiem Op. 20 by Benjamin Britten, this resulted from a commission from the Japanese government to mark the 2,600th anniversary of the foundation of the Mikado dynasty; it was refused because of its references to the Roman liturgy. Under the inspired, profound and rigorous direction of English conductor Mark Wigglesworth the works presented in this recording recapture a level of emotion too often masked by a disconcertingly academic approach. Praise, too, for the always dazzling and exemplary voice of Steve Davislim, as well as the Hamer Quartet, Cantillation, violist Roger Benedict and violinist Michael Dauth, not to forget the pianist Benjamin Martin, all of whom participate in one of the most beautiful SACDs from the start of 2012.